The work here involves crochet beading or beaded crochet. I never quite know if there is a right term to use. The end caps are also handmade, highlighted with sparkly jewels. This beaded crochet necklace is classic and striking. This shows a frontal photo of the crochet beaded rope with the golden ball. The "golden ball" is shown surrounded by 2 fancy frilled crystal spacers. This spacers are ideal for not only does it cup on one side the large round focal bead, but on the other, it creates a perfect cup for the end of the crocheted beaded rope. The "Golden Ball" close up. This is a lovely big bead made from a modern form of acrylic called Fantastic Acrylic. The new material can take on amazing metallic colors and it is still light enough to not wear the person down with weight. Here you can see a real good close-up on the fancy frilled spacer. The embedded crystals in the spacer are Middle Eastern crystals. The beads used for the beaded crochet rope are 4mm silver beads (brass base) - approximately 300 beads per side of the necklace. The beads are also anti-nickel. Handmade beaded cap ends. I purpose made them so that they give a perfect size and fit to the ends of the beaded crochet rope. This was beaded with 2mm silver beads (brass base) in Tubular Herringbone. Another closer look at the beaded end cap specifically made to go with this crochet necklace. 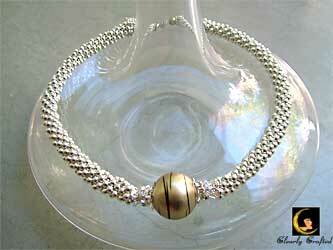 Clasp - the clasp is also a round ball to match the elemental shapes in the beaded necklace. It is a screw-on clasp, fully embedded with crystals.